Competition in standards-setting forces government to do it well. This is a multi-part series examining inherent conflicts between government and citizens. The goal of the series is to lay groundwork for avoiding the down-side of the Confucian Cycle. This series started with an article pointing out that the government gets a piece of everybody's action through taxation. A sensible government maximizes its revenue through policies that encourage growth. When people feel richer, they don't mind paying more taxes and they need less government help. Making the economy grow is a win-win, but unfortunately, making the economy grow depends more on the example set by our leaders than on government policies. When our leaders get greedy, raise taxes to fund earmarks, and look out for #1, so do the people, and down we go. History demonstrates over and over that most government policies designed to benefit the economy don't actually work because an economy is too complicated for anyone to plan it. Most new businesses fail; most new products sink without trace. Even when problems with infrastructure hold back the economy, it's usually best for private, profit-oriented organizations to tackle the problems instead of relying on government-imposed politically-based "solutions." Many people bristle at the thought of private companies making a profit out of people's need for, say, pure drinking water. They argue that water ought to be provided free. Idealists overlook the fact that water mains cost a lot of money. Under a "free water" system, the water utility has no income stream. Without an income stream, maintenance and expansion are at the mercy of bureaucrats who allocate tax revenue. Maintenance doesn't get any ego-boosting headlines so it's generally shortchanged. In most "free water" countries, 20-60% of the water is lost through leaky pipes. In "free water" systems, water mains are located based on bribery rather than on need. Middle-class businessmen truck water they get for free from the mains in their neighborhoods to poor areas where citizens don't have the political clout to get pipes and sell the "free" water at high markups. Overall, poor people end up paying more for "free" water than they'd pay if the utility could charge them enough to pay for water mains in their neighborhoods. Overall, the best the government can do is try to get out of the way by reducing obstacles to economic success. That means running predictable court systems, stable legal systems, minimizing fees and permits, and keeping taxes as low as possible. Unfortunately, all these common-sense provisions take power away from the bureaucracy. Bureaucrats are as human as anyone else and have the same ambitions; over time, they'll want fees, permits, regulations and taxes to create jobs for themselves. Promoting the economy is primarily a matter of fighting the bureaucracy. This is a never-ending job because bureaucracies grow back like weeds. Government leaders can use the "bully pulpit" to set an example, however. Deng Xiaoping was the de facto leader of the People's Republic of China from 1978 until the early 1990's. When he realized that the communist system was holding back the economy, he said, "It doesn't matter if a cat is black or white, so long as it catches mice." People understood Deng to mean that he didn't care whether businesses were run according to communist principles so long as they added value. He's generally credited with developing China into one of the fastest growing economies in the world and vastly raising the standard of living. When Ronald Reagan wanted the economy to grow, he praised the "animal spirits" of businessmen. They believed he really wanted them to succeed. Reagan helped the economy boom through a combination of tax cuts and vigorous cheerleading, just like Deng Xiaoping. Confucius said that the emperor's main job was to find corrupt government employees and cut their heads off to encourage the bureaucracy not to be a burden on the public, but the emperor also had to encourage everyone to put in more than he took out. Confucius had noticed that when government officials set an example of unselfish service, people usually go along. When government officials become corrupt, lazy, and selfish, so does everybody else. It took a sage like Confucius to point out that government officials have a great deal of influence on how people act by the behavioral standards they set, but everybody knows that someone has to set technical standards. You'd be amazed how many examples arise of issues that don't matter at all provided that everybody agrees on how it's to be done. It doesn't matter at all whether we drive cars on the left side of the road or on the right provided that everybody follows whatever standard is chosen. It doesn't matter whether electricity is 50 cycles or 60 cycles, whether its 110 volts or 220 or 440. What matters is that someone picks a standard and everybody salutes it. We Americans are fortunate to have a large number of competing standards organizations. Because there are so many standards setting bodies, no single organization can become too powerful without other organizations trying to muscle in on its turf. Unlike the US Post Office whose monopoly on first-class mail delivery is written into law, the National Bureau of Standards (NBS) competes with Underwriter's Labs, Consumer Research, ISO, and many, many other organizations. Competition keeps the NBS functioning effectively just as competition would help the public schools. Because it's always on its toes, the NBS is trusted by foreign governments which don't get along with the American government at all. Around the time when President Reagan ordered a cruise missile sent through Colonel Qadaffi's palace window as a hint that the United States didn't appreciate some of his actions, Libya signed a contract to build some LNG tankers and deliver LNG to some other country. The deal was all set, but nobody could think of a good way to determine how much LNG was in the tanks. The contract stated that the LNG was to be measured and paid for at the point of unloading from the ship. The tanks aren't built perfectly round and the ship isn't always at the same angle. They wanted to be able to unload a tanker fast so they could turn it around for more LNG; it was important to get a quick measurement so that the unloading machinery didn't have to be concerned with accurate measurement. Neither Libya nor the purchasing country was particularly fond of the US government at the time, but they both recognized the expertise and professionalism of the NBS. They knew that if the NBS did something which could not be justified on technical grounds, the NBS would suffer greatly. Their faith in the competitive nature of the specification process led them to swallow their discontent with the US government and hire the NBS to measure the tanks. The NBS mounted a transit at the lowest point of each tank and used a laser to measure the distance to many thousand points all over the inside of the tank. Once they had collected all these data points, a computer program was able to compute the exact shape of the tank. Once the shape was known, it was a simple matter to compute how much LNG would be in the tank given the angle to which the ship was tilted and the distance from the surface of the LNG to the top of the tank. The workers measure the distance to the LNG surface with a stick like the stick used to measure gasoline in gas station tanks, read the tilt of the reference surface welded to the tank, look the numbers up in a table, and voila, they know how much LNG is in the tank. The NBS is effective because it has a lot of competition. It gets a significant portion of its budget from contract work which customers could send elsewhere, so they have to stay sharp. It's a lot of work to stay sharp which is why other agencies which could be put into a more competitive environment hate the idea so much and lobby so hard to keep their monopolies. The structure of government militates against the government doing an effective job of setting standards unless there are enough competing standards organizations to keep the government honest. And from the example we see in our very own government of the one area in which it is regarded as internationally competent - that is, in the setting of technical standards - we learn the most important lesson of government effectiveness: Government will be effective and efficient if, and only if, it must compete for custom, respect, and authority with private entities. Does anyone truly believe that if vouchers were established, all public schools would simply go off gently into this good night? Of course not! No doubt some would close down, but many others would be reformed, refreshed, re-energized, and become the equal of any private school -- just as our great state universities are the equal of most private universities, and generally less expensive and far more cost-effective to boot. Would it be a bad thing if the FDA were stripped of its monopolistic authority to ban the use of medical drugs, and instead became simply a standards approval organization like Underwriters' Labs? If people trusted the FDA, they would buy only drugs with the FDA seal of approval; but if they felt that something else was best for them, they'd have the freedom to do so. This would require the FDA to become more responsive to approvals of newly discovered drugs, as well as more aggressive with responding to reports of problems with existing drugs, lest it slip into irrelevance. Why shouldn't we have private toll highways? In the early years of this country, they were common. In those few places today where they are in use, such as San Diego, they have benefited everybody. Obviously the people using them are benefited - they must be, or they wouldn't be paying the toll to use the road - but the people on the free roads are also benefited. For every car whose driver chose to pay to use the private toll road, that was one less car on the free public highway, improving traffic for all. It can be argued that the problems we see are not so much that government per se can't do anything right, but that monopolies are naturally unresponsive to external conditions. This applies to private monopolies just as much as it does to government monopolies. In the old days of the Bell Telephone monopoly, service was quite reliable but extremely expensive and highly restricted. You couldn't use your own telephones, you had to rent your actual phone handsets from the phone company, and rent anything else you wished to connect to their system. When AT&T was broken up, 19,000 workers were no longer needed and the ensuing competition has led to our modern ubiquitous communications free-for-all. We have much lower prices than before and many more different services are offered because the telephone companies have to compete for our business. You can see the same effect today with cable TV -- in places where homes are served by both a cable TV company and a telephone company offering high-speed fiber, the service is both better and cheaper than in locations served by only one. For some reason, people think that "the government" is altruistic in a way that private companies aren't. That is false. Government bureaucrats are people just like the employees at private companies -- they desire personal promotions, raises, a larger department to manage, more prestige; they have all the same motivations as every human being. The only difference is that, in a government monopoly, there is no floor to their incompetence because the government can't go bankrupt. No matter how bad a job they do, their budget keeps increasing, that's what drives the Confucian cycle. The vast majority of the students in our inner city schools are a captive audience -- it doesn't matter that attendance there is worse than no school at all, the teachers and bureaucrats are still collect their salaries out of tax payments. They will collect forever and taxes will go up forever unless something forces the system to change. Does this mean that most public school teachers are evil greedsters? Absolutely not -- they're simply working as demanded by the incentives placed before them, which is to say, not very hard -- or at least, not very effectively. As a noted management consultant pointed out long ago, "If you give me perverse incentives, don't be surprised if I act perversely." The bottom line is that our Founders were utterly correct in recommending limited government. They realized that the nature of government is to expand and become a bigger and bigger burden on the public. We've noted how the original Constitution limited government revenue; the Constitution had to be changed in order to permit an income tax. There's an old saying, "The love of money is the root of all evil." Having such a vast revenue stream available has tempted our politicians to get the government into more and more areas where government should not go. 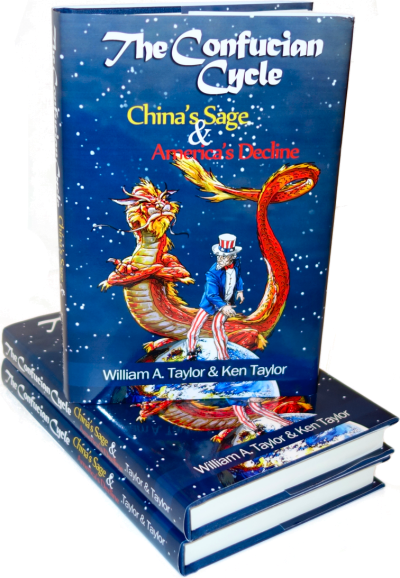 If any single event can be said to have started America on the downward path of the Confucian cycle, income tax would be at the top of the list. "Reforming, refreshing and re-energizing" schools costs a ton of money. Vouchers would kill public education because the system wouldn't have enough money to do catch up. It would be too little, too late before the sides fell in. That being said, I'm in favor of the system collapsing. Bad systems need to collapse. Also, the teachers (the good ones at least) would see the writing on the wall and run to the private schools for a job. Author say "Overall, the best the government can do is try to get out of the way by reducing obstacles to economic success" but author do not believe that really. Do the author think that government shall pass drugs and prostitutes? No!! conservatives never believe that. than why shall government not regulate economics too? Carl, if I understand what you are saying (and I'm not at all convinced I do) you are saying that the government should either be completely libertarian or completely socialist. Neither are good. We want to be economically libertarian but regulate certain social and religious conditions. Things like families and churches need to be protected. if there is any single set of words i am beginning to dispise above all others it is these two: "our Founders". every time a liberal or conservative needs to make a point sound bigger than it is, they throw those two words in. most of the time "our Founders" didn't do what is said they did. and who cares anyway. THEY WERE REGULAR MEN just like all the rest of us (except we didn't own slaves and treat women like second class citizens). i am so tired of hearing about "our Founders". how about we try to make the country as best we can off of what works and what doesn't and stop acting like we're doing the work of the gods by invoking "the Founders" every 5 seconds. "Our Founders" were men, but quite wise. They didn't agree with each other much of the time, but they did know what would make people free and happy and prosperous. They knew that government must serve the people and not the other way around. When we regularly evoke "our founders" it is because the principles and ideas that they wrote into the Constitution of the United States have been forgotten and abandoned. Their words still have meaning. Their ideas of limited government are still valid today. Their ideas about capitalism, education, democracy, partisanship, you name it, have, for the most part, been forgotten. We evoke the Founders because what they said must be remembered. We lose liberty when we move away from their principles. As for slavery and women: You must remember it was a different time and age with regard to CULTURAL norms. Both of those issues have been dealt with in the way that they provided for us to deal with them--constitutional amendments. We've forgotten that we can do this, today, too. Instead, we try to legislate from the bench. We have congress do things that it doesn't have the constitutional power to do. We lose liberty when we don't work within the rules established by the Founders. Sean, do us a favor: Go read the Federalist Papers, written by the Founders. You may learn why we reference them and also revere them, imperfect as they were.